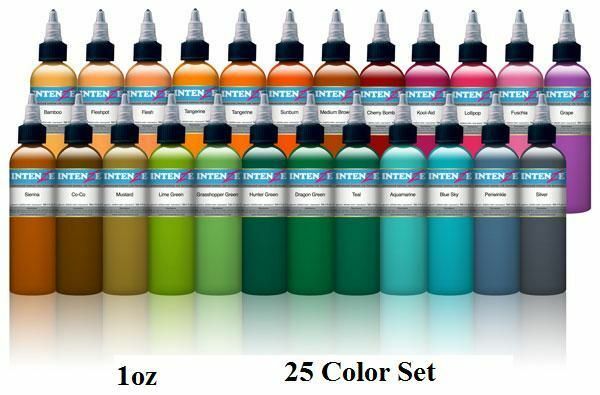 This is the Intenze New Color Set with 25, 1oz bottles of the basic colors you'll need to get started. This listing is for 25 bottles of 1oz colors from the Intenze New Color Series. The colors include: Dark Chocolate, Medium Brown, Bright Orange, Bamboo, Flesh, Sunburn, Cherry Bomb, Lollipop, Sienna, Fleshpot, Fuschia, Koolaid, Grape, Periwinkle, Blue Sky, Aquamarine, Teal, Hunter Green, Dragon Green, Grasshopper, Lime Green, Silver, Co-Co, Mustard, and Tangerine.